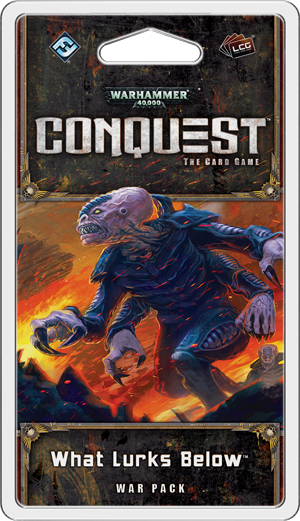 Fantasy Flight Games is proud to announce What Lurks Below, the fourth War Pack in the Planetfall cycle for Warhammer 40,000: Conquest! What Lurks Below is the next part of the Planetfall cycle, bringing another faction to bear on the fight for Sacaellum. 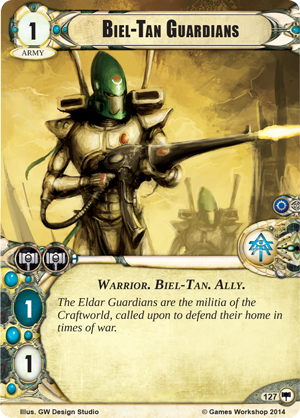 Here, you’ll find cards that support the main themes of the cycle by bringing new significance to the planet type symbols and inviting you to fight for your faction’s unique goals. 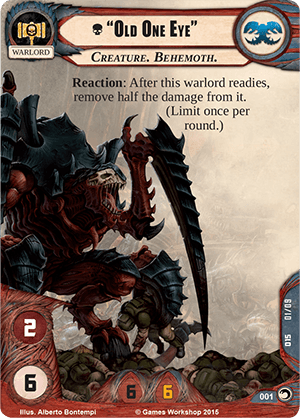 This War Pack also offers a new Tyranids Genestealer warlord and his eight-card signature squad as well as fifty-one other cards (three copies each of seventeen distinct cards) to swell the armies of other factions. You can swarm out of the Kaerux Erameas with the Tyranids. You can declare a holy crusade with the Black Templars. You may even travel across the sector instantaneously in a corrupted teleportarium. In What Lurks Below, every faction gains new ways to wage war and new reasons to fight. 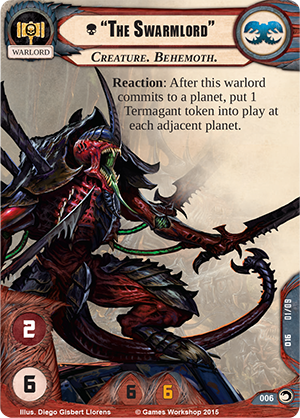 The Tyranids are relative newcomers to the Traxis sector, first arriving in The Great Devourer; their forces led by "The Swarmlord" (The Great Devourer, 6) and "Old One Eye" (The Great Devourer, 1). The Planetfall cycle brings a new Tyranids warlord to the forefront of the battle, a Genestealer known in the Imperium as "Subject: Ω-X62113" (What Lurks Below, 71). The ability to ambush any of your Genestealers into play at infested planets has immense ramifications. When “Subject: Ω-X62113” is your warlord, your opponent will have to be doubly careful. Any battle on an infested planet could turn into a bloody rout as your Genestealers ambush your opponent. 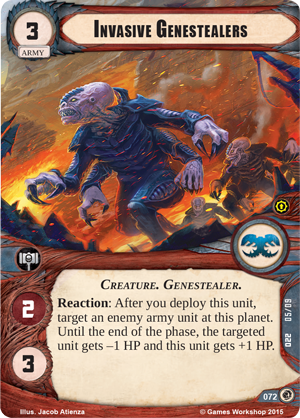 Because this ability is only limited by the number of infested planets in play, your Genestealers will be able to attack without warning across the Traxis sector. Some Genestealer units have already entered the game, such as the Ymgarl Genestealer (The Great Devourer, 29). “Subject: Ω-X62113” brings additional Genestealers in its signature squad. 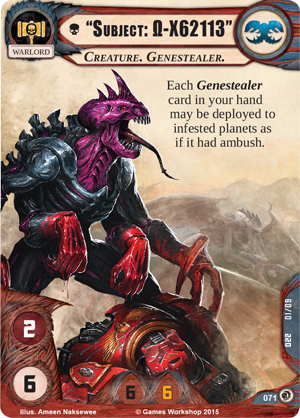 There, you’ll find four copies of the Invasive Genestealers (What Lurks Below, 72). The Invasive Genestealers can hold their own in a fight or even tip the scales in a command struggle, but their true power lies in their Reaction. After you deploy an Invasive Genestealers unit, you can choose any enemy army unit at the planet. 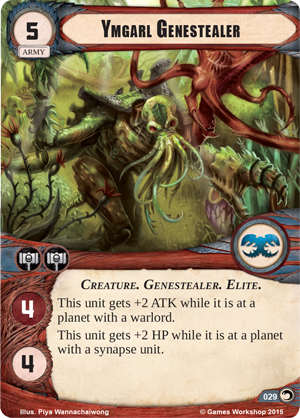 Until the end of the phase, the chosen unit’s HP is lowered by one, and the Invasive Genestealers’s HP is raised by one! Under normal circumstances, you can use this ability to easily slay low-HP units like the Rogue Trader (Core Set, 171) or the Biel-Tan Guardians (Core Set, 127). If you ambush the Invasive Genestealers into play with your warlord’s ability, however, their ability could turn the tide of a battle by lowering a crucial unit’s HP. A Genestealer ambush becomes much more dangerous when you have Ruined Passages (What Lurks Below, 73) in play. As a Combat Action, you can exhaust and sacrifice the Ruined Passages to ready each Genestealer unit you control at a target planet! 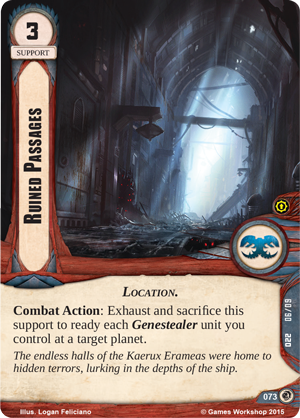 Essentially, Ruined Passages allows all of your Genestealers to strike twice in one round of combat, and although you can only use it once, Ruined Passages can easily turn the tide of battle in the Tyranids’ favour. You can make your Genestealers and other units much more dangerous with the addition of Lethal Toxin Sacs (What Lurks Below, 75). This attachment can be attached to any army unit you control, granting that unit a greatly increased ATK in exchange for a slightly lowered HP. In addition, like all other signature attachments, Lethal Toxin Sacs boasts three shield icons – more than any other non-signature card. In most decks, you must choose whether you want to use your signature attachment for its ability or as a powerful shield card. Lethal Toxin Sacs allows you to do both, because you can deploy this attachment from your discard pile as while as from your hand. 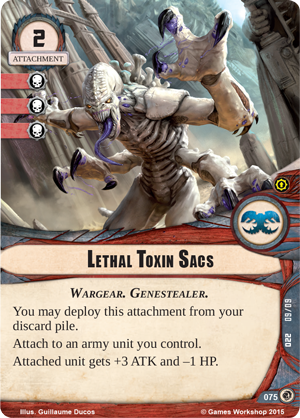 What’s more, Lethal Toxin Sacs has the Genestealer trait and you can ambush it into play at infested planets using your warlord’s ability to make a sudden devastating attack. The final card in the signature squad of “Subject: Ω-X62113” allows you to spread the influence of the Genestealers and corrupt other races to your cause. 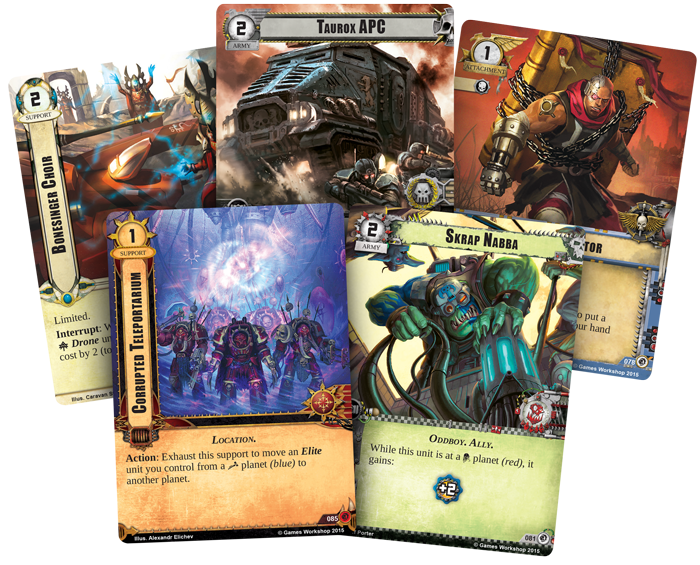 This signature squad includes two copies of Gene Implantation (What Lurks Below, 74) – an event that you can play after one of your Genestealer units destroys an enemy unit with a printed cost of three or lower to put that unit into play under your control at the same planet. 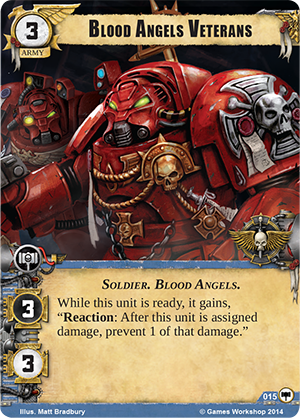 Imagine the possibilities if you could bring a unit of Blood Angels Veterans (Core Set, 15) over to your side! 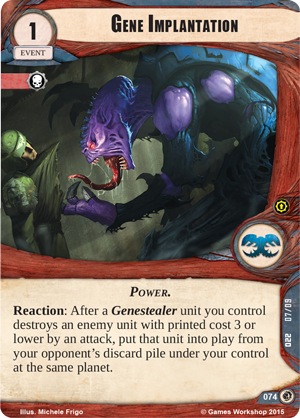 With Gene Implantation, even your opponent’s dead units aren’t safe from the depredations of the Tyranids. Join the fight for Sacaellum and look for What Lurks Below at your local retailer in the fourth quarter of 2015! 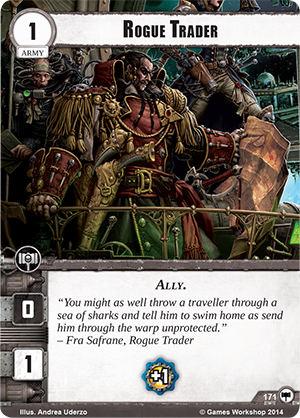 Warhammer 40,000: Conquest: What Lurks Below © Copyright Games Workshop Limited 2015. Conquest, the Conquest logo, GW, Games Workshop, Space Marine, 40K, Warhammer, Warhammer 40,000, 40,000, the ‘Aquila’ Double- Headed Eagle logo, and all associated logos, illustrations, images, names, creatures, races, vehicles, locations, weapons, characters, and distinctive likenesses thereof, are either ® or TM, and/or © Games Workshop Limited, variably registered around the world, and used under license.